Hidden in the predominately chinese center known as Diamond Plaza in Rowland Heights, I was surprised to see a ramen-ya that was actually being operated by native japanese speakers. Nevertheless, this restaurant with a familiar name, Tampopo, was a must try for the ramen lover in me. I didn’t expect too much at first, especially due to the reputations of “other” Tampopo restaurants in Southern California with below average ramen. Not to mention that this place is new and located in an odd food court style room where all five restaurants are separated by four-foot tall barriers. Service was great considering I was only one of five other customers. It will be interesting to see how service changes once they become busier. Anyway, on to why we are here–the ramen! 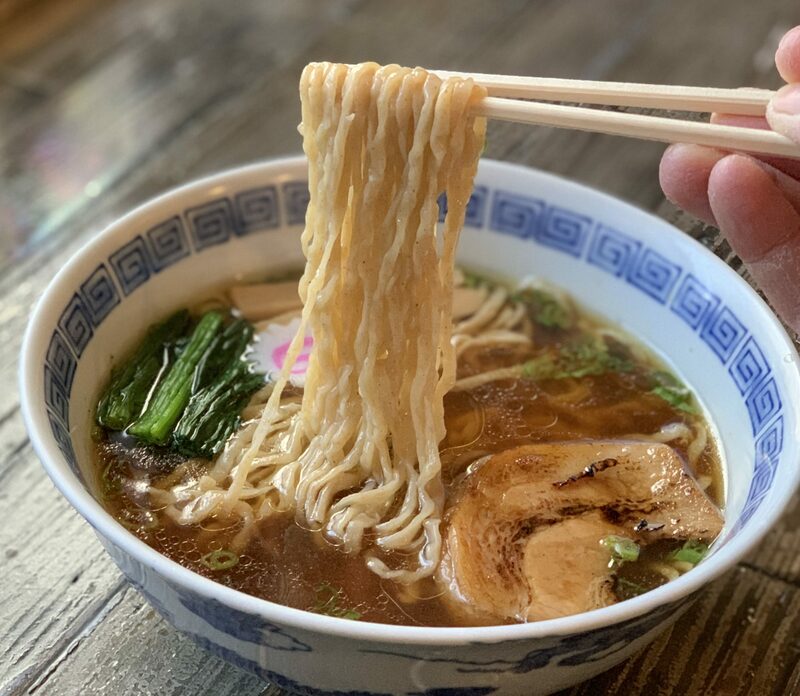 Shoyu-ramen (soy sauce flavored): Since shoyu-ramen is typically the most popular, it is generally the best to use in determining ramen quality. I typically like to judge a ramen by the texture of the noodle, flavor of the base, and the union of toppings with the overall ramen. In this case, the noodles were very good (almost perfect…almost), the soup base was average, and the toppings did not impress me at all. But I did enjoy being there and I will definitely be coming back soon. Mabo-ramen: By far the best ramen (see pic below) that I have tasted to date from this place. The noodles were consistently great once again but the major difference was the flavor of the mabo sauce. 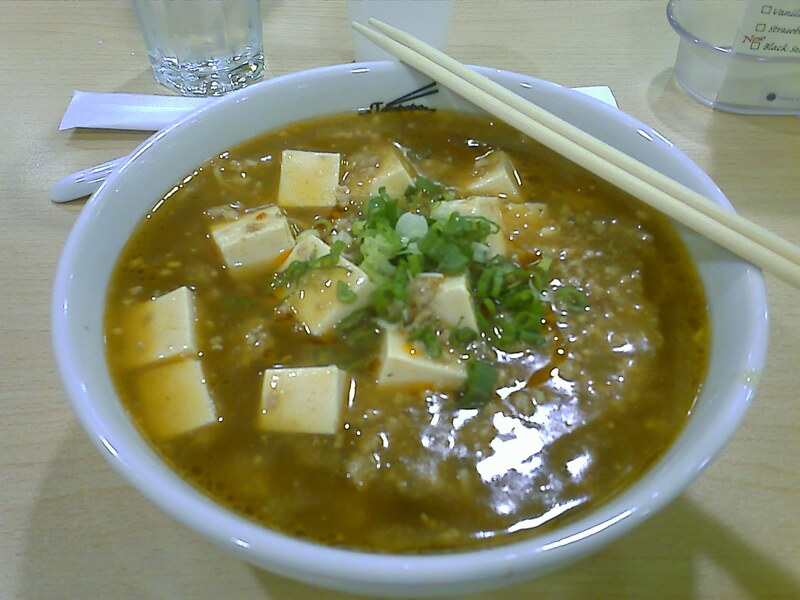 I’ve tasted watery mabo ramen in the past from other restaurants that were either too spicy or not spicy enough. This was very different. The ground pork, tofu, and mabo sauce all blended with the soy sauce base perfectly. I definitely recommend this to everyone. I think I just might even have to order mabo ramen from now on! 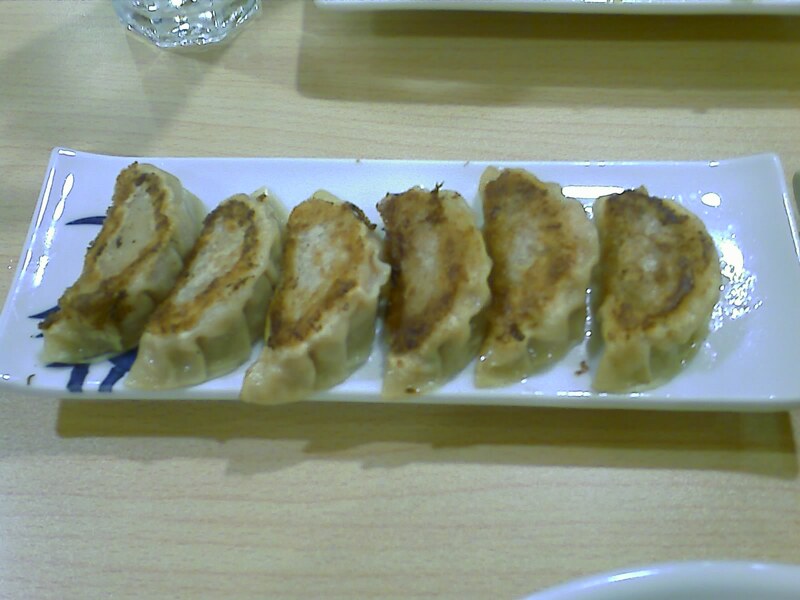 Gyoza: Okay, it is hard to find a decent gyoza these days and this was no exception. It is only worth mentioning the gyoza to tell you NOT to order it. Don’t waste your money or taste buds on this one! You can even see the unworthiness in the pic below. Special Hiyashi: I didn’t try this myself but from what I hear it was pretty good. 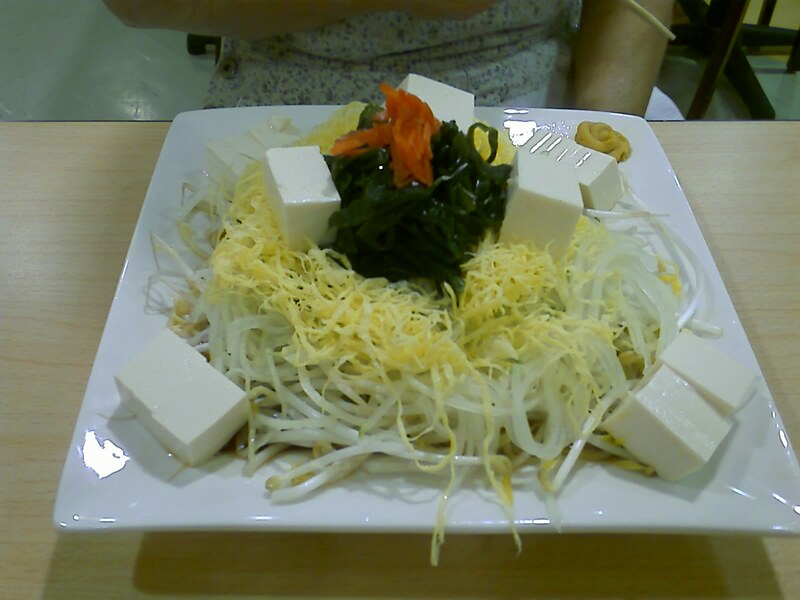 Compared to the traditional Hiyashi-chuuka (summer ramen), this one does not include ham and is noted as a vegetarian dish. With tofu replacing the ham, this is a vegetarian delight on a hot summer day. The only complaint that I heard was the plate being too small and awkwardly shaped to mix up all the ingredients. I’d skip the gyoza & chahan here to save room for KiwiBerry’s yogurt with mochi balls & strawberries. Since it’s also located in the same Plaza…it makes the trip much more worth it. Actually, now that I think about it…I’d skip Tampopo & go straight to KiwiBerry!!! Tampopo also has a fairly good shoyu ramen…..as for the gyoza, i fully agree with you, it’s only worth mentioning NOT to get it.